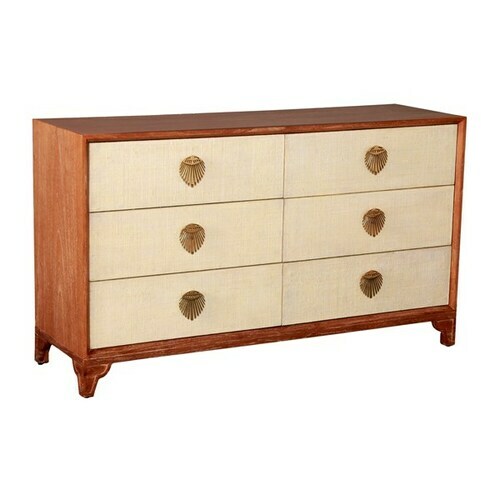 Part of our Florence Broadhurst Collection, this is an art deco styled dresser in natural features "Kabuki" a bold fan like motif on the solid brass hardware. Drawing its inspiration from the avante-garde, Japanese theatre, Kabuki is the art of singing and dancing in a manner that is out of the ordinary, and inspiration from Florence's theatrical past. The solid wood dresser features wrapped raffia door fronts. Not eligible for return or exchange. Please view our return policy for more information. Ships UPS, FedEx ground or white glove delivery.